Bob Lemmons is famous for his ability to track wild horses. He rides his horse, Warrior, picks up the trail of mustangs, then runs with them day and night until they accept his presence. Bob and Warrior must then challenge the stallion for leadership of the wild herd. A victorious Bob leads the mustangs across the wide plains and for one last spectacular run before guiding them into the corral. Bob?s job is done, but he dreams of galloping with Warrior forever?to where the sky and land meet.This splendid collaboration by an award-winning team captures the beauty and harshness of the frontier, a boundless arena for the struggle between freedom and survival. 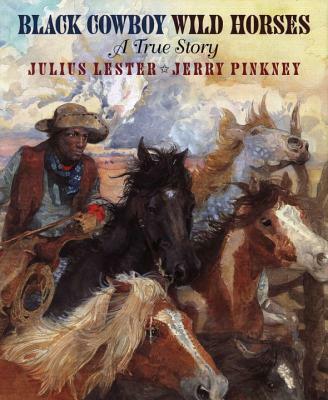 Based on accounts of Bob Lemmons, a former slave, Black Cowboy, Wild Horses has been rewritten as a picture book by Julius Lester from his story ?The Man Who Was a Horse? in Long Journey Home, first published by Dial in 1972. Born in 1939, Julius Lester spent his youth in the Midwest and the South and received a B.A. in English from Fisk University in 1960. Since 1968 he has published 25 books of fiction, nonfiction, children's books, and poetry. Among the awards these books have received are the Newbery Honor Medal, American Library Association Notable Book, National Jewish Book Award Finalist, The New York Times Outstanding Book, National Book Critics Circle Award Finalist, Caldecott Honor Book, the Boston Globe-Horn Book Award, and a National Book Award Finalist. His books have been translated into eight languages. He has published more than one hundred essays and reviews in such publications The New York Times Book Review, The New York Times Op-Ed Page,The Boston Globe, The Village Voice, The New Republic, Katallagete, Moment, Forward, and Dissent. He has recorded two albums of original songs, hosted and produced a radio show on WBAI-FM in New York City for eight years, and hosted a live television show on WNET in New York for two years. A veteran of the Civil Rights Movement, his photographs of that movement are included in an exhibition at the Smithsonian Institution and are part of the permanent photographic collection at Howard University. After teaching at the New School for Social Research for two years, Mr. Lester joined the faculty of the University of Massachusetts/Amherst in 1971 where he is presently a full professor in the Judaic and Near Eastern Studies Department, and adjunct professor in the English and History departments. He also serves as lay religious leader of Beth El Synagogue in St. Johnsbury, Vermont. He has been awarded all four of the university's most prestigious faculty awards: The Distinguished Teacher's Award; the Faculty Fellowship Award for Distinguished Research and Scholarship; Distinguished Faculty Lecturer; and recipient of the Chancellor's Medal, the University's highest honor. In 1986 the Council for Advancement and Support of Education selected him as the Massachusetts State Professor of the Year. Mr. Lester's biography has appeared in Who's Who In America since 1970. He has given lectures and papers at more than 100 colleges and universities. His most recent books are John Henry, And All Our Wounds Forgiven, a novel about the civil rights movement, and Othello, a novel based on the Shakespeare play. In addition to his work on children's books, he is an extremely successful artist who has had eleven one-man retrospectives at venues ranging from the Museum of the National Center of Afro-American Artists to the Art Institute of Chicago. His current one-man show entitled, "Building Bridges, the Art of Jerry Pinkney" was organized by the Pittsburgh Children's Museum and will be traveling through 1998. Mr. Pinkney has illustrated for a wide variety of clients, including National Geographic , the National Parks Service, the U.S. Postal Service, the American Library Association and the Association of Booksellers for Children. Born in Philadelphia in 1939, Jerry Pinkney states, "(I) took an interest in drawing very early in my life, and at some point I realized I'd rather sit and draw than do almost anything else." While growing up in the Germantown section of Philadelphia his interest in art was supported by hisfamily -- especially by his mother. "She certainly understood me and made it clear to everyone that if art was what I wanted to pursue, then that's what she wanted to have happen. My father also became very supportive, and when I wanted to take art classes after school he found ways for me to attend." In junior high school Mr. Pinkney had a newsstand and took a drawing pad with him to work every day and sketched passersby. That was how he met the cartoonist John Liney, who encouraged him to draw and showed him the possibilities of making a living as an artist. After graduating from the commercial art program at Dobbins Vocational School, where he met his wife, author Gloria Jean Pinkney, Jerry Pinkney received a full scholarship to attend the Philadelphia Museum College of Art (now University of the Arts). While at PCA he and Gloria married. After their first child was born, they moved to Boston, where Mr. Pinkney worked as a designer at Rustcraft Greeting Card Company, and at Barker-Black Studio where he developed his reputation as an illustrator. Eventually he opened Kaleidoscope Studio with two other artists. Later he opened his own freelance studio -- Jerry Pinkney Studio -- and moved to New York. Sensitivity to and an interest in a variety of cultures has always been a dominant theme of Mr. Pinkney s work. He has also drawn inspiration for a significant part of his work from African American culture. Among his numerous projects are his twelve postage stamps for the U.S. Postal Service Black Heritage series. Mr. Pinkney was a member of its Advisory Committee for ten years and he was also invited to join the NASA artist team for the space shuttle Columbia. "I wanted to show that an African American artist could make it on a national level in the graphic arts. I want to be a strong role model for my family and for other African Americans." Many of Mr. Pinkney's children's books celebrate multicultural and African American themes. "Working on both the Uncle Remus tales and John Henry has shown me an important link between pivotal and opposite African American folk heroes. Brer Rabbit, the sly trickster, originated during slavery and was the first African American folk hero. Slaves who wanted to get the better of their masters needed to be cunning and sly -- hence the trickster role. However, later comes John Henry, a free man, whose strength and valor bring him fame. He was a strong folk hero for African Americans, a symbol of all the working men who made a major contribution to the building of the roads and railroads in the mountains of West Virginia -- a dangerous job for which many paid with their lives." Mr. Pinkney's two latest books areThe Little Red Hen and The Old African by Julius Lester (illustrated by Jerry Pinkney). Books give me a great feeling of personal and artistic satisfaction. When I'm working on a book, I wish the phone would never ring. I love doing it. My satisfaction comes from the actual marks on the paper, and when it sings, it's magic". Jerry and Gloria Pinkney live in Westchester County, New York. The Pinkneys have four children: Troy, Scott, Brian, and Myles, and seven grandchildren. Two of the Pinkney's children are also involved in children's book illustration, Brian through illustrations, and Myles throughphotography. In addition to illustrating children's books and other projects, Mr. Pinkney has also been an art professor at the University of Delaware and State University of New York at Buffalo. He has given workshops and been a guest lecturer at universities and art schools across thecountry.